Sgt. 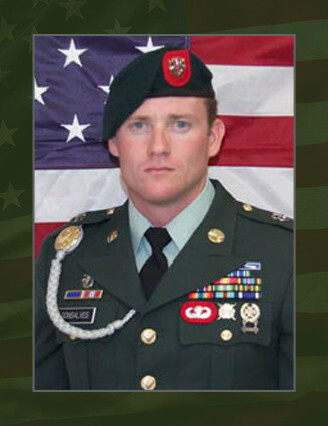 1st Class Chad A. Gonsalves, 31, a Special Forces weapons sergeant assigned to 3rd Battalion, 7th Special Forces Group (Airborne) at Fort Bragg, N.C., died Feb. 13, 2006, when an Improvised Explosive Device detonated near his Humvee north of Deh Rawod in central Afghanistan. A native of Turlock, Calif., Gonsalves enlisted in July 1996 as an infantryman. His first assignment was with 1st Battalion, 18th Infantry Regiment at Conn Barracks near Schweinfurt, Germany where he served for four years. Gonsalves attended the Special Forces Qualification Course in 2000 and was assigned in November 2001 to 3rd Battalion, 7th SFG (A), as a weapons sergeant, where he served until his death. His military education included the Special Forces Qualification Course, Ranger Course, Combat Diver Qualification Course, Special Operations Target Interdiction Course, Survival, Evasion, Resistance and Escape Course, Spanish Basic Military Language Course, Special Forces Assessment and Selection Course, Basic and Advanced Airborne Courses, Jumpmaster Course, Basic Combat Training, Advanced Individual Training for Infantryman, Primary Leadership Development Course and Basic Noncommissioned Officer Course. His awards and decorations included the Joint Service Achievement Medal, the Army Achievement Medal, the Army Good Conduct Medal, the National Defense Service Medal, the Armed Forces Expeditionary Medal, the Armed Forces Service Medal, NATO Medal, the Global War on Terrorism Expeditionary Medal, the Global War on Terrorism Service Medal, the Noncommissioned Officer Professional Development Ribbon, the Army Service Ribbon, the Combat Infantryman Badge, the Expert Infantryman Badge, the Parachutist Badge, the Special Operations Diver Badge, the Ranger Tab and the Special Forces Tab. His posthumous awards include the Bronze Star Medal for valor, the Purple Heart and the Meritorious Service Medal. He is survived by his wife, Julie, and three sons, Cody, Blake and Dylan of Spring Lake, N.C. His parents, Larry and Marsha Gonsalves, of Turlock, Calif, also survive him.